Roll towel dispensers, particularly those that are automated, are very popular in commercial and institutional settings such as office buildings, schools, and medical and retail facilities. The towels themselves are offered in an array of capacities, for high-traffic facilities such as arenas and event venues or for standard-sized facilities. Common roll lengths are 400 feet, 800 feet and 1,000 feet. High-capacity towels are often designed with reduced core sizes so they can fit into standard-size dispensers, reducing time and associated labor costs spent on change-outs. Controlled roll towel dispensers deter theft, as users can take only the amount dispensed on a timed delay. Maintenance-wise, a battery schedule should be posted and accessible to janitors. 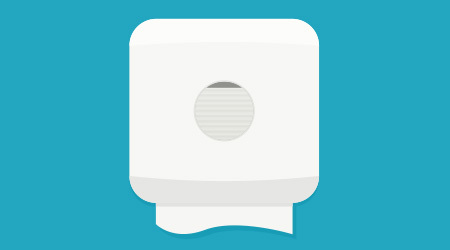 Most dispensers feature a low-battery light to indicate that the battery needs replacement, but they will still operate for a period of time before it dies.